Bne Intellinews reports on Russian demographics and population decline, citing statistics from state agency Rosstat that Russian population fell from 146,880,432 at the beginning of 2018 to 146,793,744 at the start of 2019, a decrease of 86,688. Russian rural population reportedly is declining at an accelerated pace. 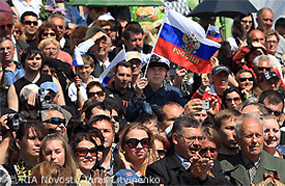 Already, 109.45 million Russian live in cities, compared with 37.34 million in rural areas. The Moscow region, with 12.63 million inhabitants, is the most densely populated.